Warren Brush is a mentor, storyteller, a certified Permaculture designer and teacher, as well as a husband, a father and a grandfather. He has worked for over 25 years in inspiring people of all ages to discover, nurture and express their inherent gifts while living in a sustainable manner. He is co-founder and a tender of Quail Springs Permaculture, Regenerative Earth Enterprises, Sustainable Vocations, Wilderness Youth Project, Casitas Valley Farm and Creamery and his Permaculture design company, True Nature Design. 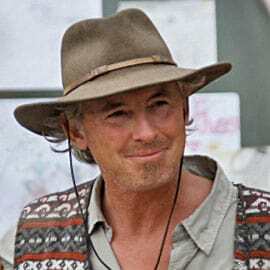 Warren works extensively in Permaculture education and sustainable systems design in North America, Africa, Middle East, Europe, and Australia. He has devoted many years to mentoring youth and adults to inspire and equip them to live in a sustainable manner with integrity and a hopeful outlook. His mentoring includes working with those who are former child soldiers, orphans, youth, young adults, families and indigenous peoples worldwide. He teaches courses including: Permaculture Design Certification, Permaculture for International Development, Train the Trainer, Consultancy Training, Rainwater Harvesting Systems, Ferro-Cement Tank Building, Spring Rejuvenation, Compost Toilet Systems, Water for Every Farm, Drought Proofing, Earthworks, Ecological Restoration, Cultural Mentoring, Introduction to Permaculture Systems, Food Forestry, and Origins Skills among other offerings.